On a cooling Saturday morning at around 26 Degree Celsius, the best thing to do is probably doing nothing and just cozy at home. But that's not what I did, I went back to office for a couple of hours to complete some of the outstanding tasks before my long leave from the mid of next week (will be heading to Taiwan for holiday). In life, many of us are studying and working hard/smart while waiting patiently for the special moments/triggers to knock our door, we usually call them OPPORTUNITIES! In fact, opportunities are everywhere, many a time it disguises itself in many size and form. 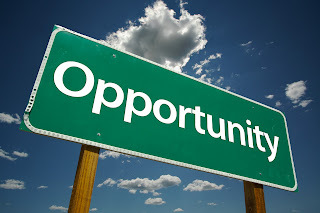 Of course, not every opportunity will turn out to be a grand successful story, opportunities are mere chances that we can take to make a (potential) better future/success story, but there is no guarantee. In short, Opportunity < > Success! 1. Introduced by a peer retail investor friend to a local advertising network for potential partnership, a meal appointment has been scheduled next week to look into the possibilities. Am looking forward to meet the new friend and hope it will open up yet another door for my passive income stream. Will update more if there is any progress on this opportunity. 2. Honored to receive an email from the organizer of the hugely successful inaugural financial bloggers Seminar in early part of this year with a complimentary ticket to their upcoming event in September 2015. I missed the earlier event and hope to be able to attend this event and meet them up close and personal. For me, this is a great learning opportunity, especially from the personal finance and investment spectrum. What opportunities have your grab or missed this week?